Go here if you'd like to read this issue on our website. An email extension of the Pure Water Gazette. In this issue of the Occasional you'll hear about water-scrubbing phreatoicids, ceramic water filters, and galvanized pipes. Find out how to get rid of benzene, how to get free humming lessons, and how to recognize bacteria by their swimming stroke. Find out the identity of the oldest water filter company in the world and the name of the sneaky pathogens that may be lurcking in your shower head. Discover how many gallons of water can be treated with a single bottle of bleach, hear about a man who died of drinking too much water, and as always, much, much more. The Occasional is overseen and edited by Pure Water Gazette editor Hardly Waite. While you weren't paying attention, a lot of important things went by. Follow the links if you want to read more. A Montana rancher blamed well problems on oil drilling, and the EPA found fracking chemicals in well water. Despite much gnashing of teeth, New York will have deposit on bottles. University of Colorado research has found that bathroom shower heads can deliver "a face full of pathogens," including Mycobacterium avium, a pathogen linked to pulmonary disease. Proving that my Mom was right after all, a new study confirmed that chlorine in swimming pools contributes significantly to children's allergies. The nation's best water recylers were given awards. Yale University engineers for the first time tracked the classy upstream swimming technique of e. Coli. Many alternative energy projects are being held back because they use massive quantities of water. 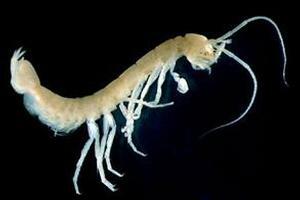 Ancient creatures called phreatoicids are keeping New Zealand's water clean. People who drink plain water were found to have a higher intake of fiber and vegetables. Well contamination by pesticides banned since the 1970s has caused Connecticut officials to provide carbon filters for home owners. A surprising report suggested that galvanized pipes in homes may be a source of lead in drinking water. University of Chicago Medical School research indicated that ingesting water can be a significant pain reliever. A Chinese restaurant in Scotland may close because of an outrageous water bill. A man died in England from drinking excessive amounts of water. Amnesty International accused Israel of hogging water. It's a good idea to have a plan to provide water for an emergency, whether it is the expected end of the world scenario we saw at Y2K or a far more likely "boil water" notice from your local water supplier. If there is a the "boil water" situation because of bacterial contamination, your regular, everyday home drinking water system may or may not be suitable. You can trust a ceramic filter, an ultraviolet system. or a steam distiller to make bacteria-contaminated water safe, but you shouldn't rely on a regular carbon filter. Carbon filters are designed to do something else. They're great at reducing chemicals but they aren't designed to deal with bacteria. The so-called "bacteriostatic" carbon filters containing silver or KDF are not water purifiers; don't expect them to make contaminated water safe. A reverse osmosis unit is theoretically capable of producing bacteria-free water because bacteria are much too large to pass through the RO membrane, but since the equipment is not designed to remove bacteria, RO manufacturers do not recommend them for use with non-potable water. For emergencies of longer duration, it's good to have a plan--and some simple equipment. Often, if you don't have safe water coming from your tap, you don't have any water coming from your tap. This means that while you may be able to find water in a swimming pool, your hot water heater, or a nearby lake or river, it won't be pressurized, so you won't be able to process it through your regular home water treatment equipment. Also, genuine emergencies usually involve loss of electricity, so electric distillers and ultraviolet systems are of no value. The common commercial products sold to provide safe water without the assistance of water pressure include the expensive gravity-driven multi-cartridge ceramic filters and the tiny (also expensive) pump-driven filters (also ceramic or a variation on ceramic). Ceramic has long been the standard for bacteria removal. A ceramic filter is just a very tight screening device. It's so tight that bacteria, or cysts like giardia or cryptosporidium, won't go through it. Doulton, the predominant maker of ceramic filters, is the world's oldest water filter maker. Doulton ceramics are the filters used in the expensive gravity units that were much in demand in 1999. At that time we (Pure Water Products) began selling the same Doulton ceramic filter but with a water delivery system that cost $7 rather than $300 and actually outperformed the expensive stainless steel gravity filter in terms of gallons per day production. Chlorine has been used by municipalities to make water safe from bacterial contamination since early in the last century. It will still work even if computers fail or if a flood knocks out your city's water supply system. Ceramic filters were invented for the purpose of making the polluted water of the Thames safe to drink. With the help of the principle of siphoning, which has never been known to fail, either chlorine or filtration through ceramic can provide safe water for emergencies even in the absence of electrical power or pressurized water. This issue's featured water issue is benzene, an EPA regulated chemical contaminant of water and a known carcinogen. The EPA maximum allowable for benzene is only 5 parts per billion. Benzene enters the environment from a variety of sources. In drinking water, the main source of this contaminant is gasoline, often through leaking gasoline storage tanks and fuel spills. The best way to get benzene out of drinking water is with activated carbon filtration. This means that if you have a high quality carbon filter or reverse osmosis drinking water system, benzene should not be a worry. Benzene can also be treated with ozone. Go to the Occasional's Water Issues section for a full discussion of benzene and other water issues. Several new articles have been added to the Occasional's How It Works series of straightforward explanations of how water treatment devices function. For example, whole house reverse osmosis, backwashing filters, and undersink filters have been added recently. Bodies, tiger or human or anteater, have no unnecessary parts; neither do they have unnecessary gestures, sensations, and activities. Coughing, belching, hiccupping, scratching, frowning, spitting, wheezing, twitching, snorting, weeping, snarling, blinking, yawning, farting, flinching, sneezing, smiling, itching, licking, pouting, slobbering, shivering, laughing, grieving, groaning, hurting--all have their purpose.--Tiger Tom, On Pain. Gazette Columnist Tiger Tom can now add humming to his list of essential activities, for Swedish researchers have proven something that is obvious to anyone who pays attention: Humming is good for you. A Shower Filter Can Bring Joy to Your Life. The researchers measured hummers' exhalation levels by tracking nitric oxide (NO), a gas produced in the lungs and nasal passages to help blood vessels dilate. Humming increased the NO released into the nose from the sinuses. Humming also facilitated the exchange of air from sinuses into nasal passages, which essentially ventilates the sinuses and protects them from infection. If you just want to experience for yourself the exhilarating efficacy of Hardly Waite Humming Therapy, throw away your sinus drops and start humming. Start and end each day by humming at least two verses of the "Ode to Joy" section of Beethoven's Ninth Symphony. Your sinuses will rejoice and your spirits will soar. And, if after 5 years of Hardly Waite Humming Therapy you conclude that it hasn't given you healthier sinuses and a more joyful disposition, just write me and I'll cheerfully give you double your money back. Disclaimer: The Pure Water Gazette does not recommend that you hum without consent and direction of a qualified health professional. Note: The article above is reprinted from the Pure Water Gazette's web site. See what you're missing by not reading the Gazette. Currently featured (among a few hundred other pieces) in the Pure Water Gazette: The New York Times reports that Clean water laws are being widely ignored and ten percent of Americans are drinking unsafe water. Our Sponsor. The Pure Water Gazette. This is an uncopyrighted publication. Borrow as you will.